Howard at the meeting house very pleasantly indeed. Evelina and Oakes saw Oakes’s younger brother William at church, probably for the first time since William had returned to town. The relationship between the two brothers was not cordial, but the families sat together in the same pew (or set of pews, given the size of the extended family) and could hardly have avoided one another. As usual, Evelina enjoyed listening to Mr. Whitwell’s sermons. She enjoyed the “intermition” between the morning and afternoon service at the church, too. She spent it sitting with Nancy Howard, mother of Ellen Howard on whom Evelina had called earlier in the week. The formality of the times shows in Evelina’s referring to Nancy not by her first, or Christian, name, but by her husband’s name. Even in her own journal, writing of friends, Evelina maintained the nomenclature of “Mr.” and “Mrs.” Formality of address was second nature to her, as it was to most well-bred people of the day. Even husbands and wives typically referred to one another as “Mr.” and “Mrs.” when speaking in the third person. Oakes Ames must not have gone into Boston the day before or, if he did, he failed to return with the latest magazines. For her reading that night, Evelina opted to look over old issues of The Saturday Courier . Where was this paper published? Not in Easton, not in Boston. Bridgewater? Canton? Stoughton? Taunton? Does any reader know about this newspaper? It also may be that Oakes was away from Easton this week. He often traveled to other nearby states for the shovel company, taking orders and collecting accounts, a task that his middle son, Oliver (3), would eventually take on. 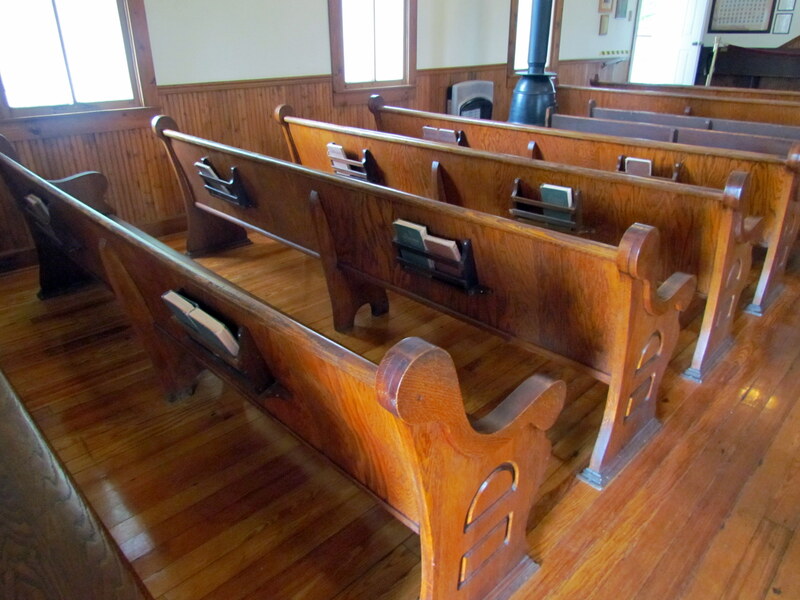 *Photo from Down in the Caves Church Pew Company.